The Brother ScanNCut is one of the only die cut machines with a scanner hence makes it costlier than the Silhouette Cameo. The built-in 300DPI scanner allows stamped images, drawings, photographs,digital images etc to be scanned & cut by the machine leaving a border if u wish to. Built-in 300 DPI Scanner to scan and create designs. Full color LCD touch screen to edit designs. 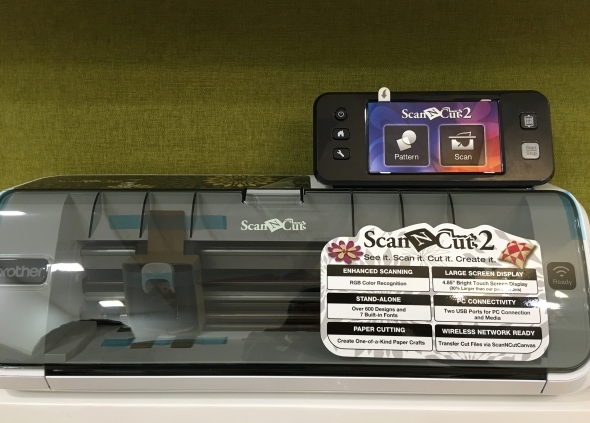 The ScanNCut is a stand alone machine as it has a touch screen to edit and manipulate designs and it need not be plugged in a computer to perform its basic job. You can use the free Brother ScanNCut Canvas software,that allows users to import jpg and svg file types. You can import designs that were created on the computer, but you will need to use a USB drive to transfer the files from the computer to the machine. The Brother ScanNCut does come with some pre-loaded designs and fonts. I got mine few days back and wanted to share the unboxing of tis amzing machine. I will list the products which come along in the box . Awesome... Looking forward to your experience using it! I wish to buy this 1 day.its awesome.